2 Over the years, cars have gotten better. They have gotten faster. They have gotten more comfortable. They have gotten safer. Airbags are one thing that has been added to cars to make them safer. Airbags help to keep drivers safe when an accident happens. 3 Airbags are hidden inside cars. One airbag is hidden in the steering wheel. One airbag is hidden in the dashboard on the passenger's side of the car. Some cars have airbags that are hidden around the windows on the sides of the car. If the car is in a crash, the airbags inflate. They pop out of their hiding places. 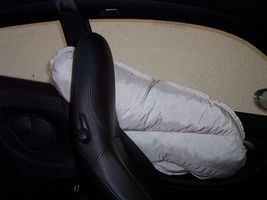 The airbags act as pillows to protect the heads of the people in the car. How do the airbags work? How do they know when the car has been in a crash? Feedback on How Do Airbags Work?